Severe weather can happen quickly, sometimes without warning, and cause extreme damage to the trees on your property, causing branches, limbs or entire trees to fall. The destruction caused by downed trees, branches and debris can be devastating for home and business owners, and the process of cleaning up the debris can be both overwhelming and dangerous. When severe weather strikes and causes damage to your property, do not try to remove it yourself! Contact the storm damage professionals at Adirondack Tree Surgeons. 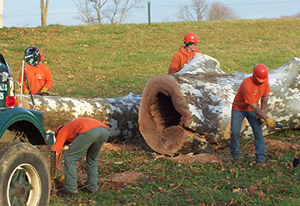 Our team provides prompt, professional service following the occurrence of storm damage and works to carefully clear away dangerous trees, branches and storm debris. We will respond immediately and work quickly and efficiently to safely remove the fallen trees and branches from your property. No matter the time of year or extent of the damage, we can provide assistance in cleaning up your property and ensuring that no further damage is inflicted. We have years of experience providing storm damage service to areas within Upstate NY and the Adirondacks including Saratoga Springs, Clifton Park, Ballston Spa, Malta, Glens Falls, Lake George and more. To learn more about the Capital Region and Upstate NY areas we service, please visit our Service Area page. Contact us today for your free quote if you are in need of storm damage services or call our emergency response team any time of the day or night, 24/7 at 518-792-2225.